"...Gordon McConnell...brings into his work a rare fullness of mind, an unusual ability to understand the West in the round. He understands revisionist history, yet loves the grand old themes; he's adept at postmodern irony, yet does not condescend to the cowboy. "In Runaway Chase, we see a cowboy chasing after a runaway coach....The rider may catch the prize in the movie, but the two remain forever apart in the painting. The existential aura is further enhanced by the cloud of dust that surronds him. In the paintings, the dust does not read as simple dust, as it does in the movie, but as a strangely unfinished emptiness. 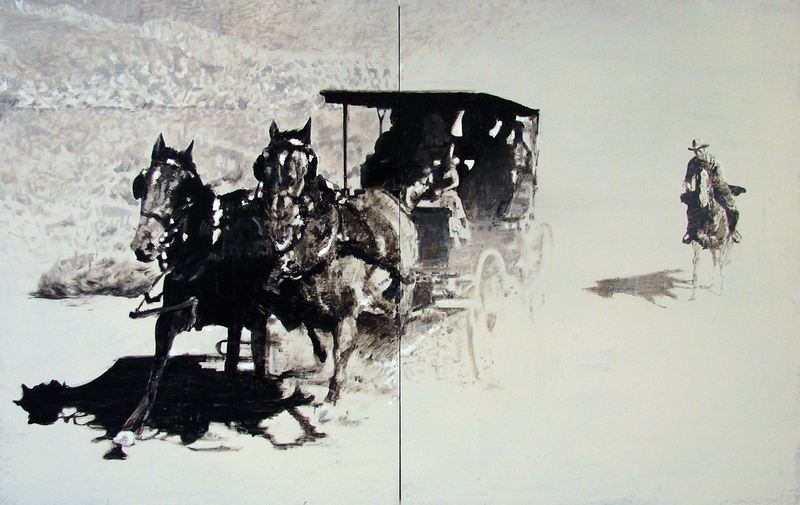 The cowboy seems isolated in a void (the backgrounds of these paintings often have a sketchy mystery). The picture then becomes, among other things, a fresh depiction of the classical theme of the existential cowboy." Anna Paige, Gordon McConnell's works question the romanticism of western films, BILLINGS GAZETTE, September 14, 2018. Hayden Seder, Best of the West: Gordon McConnell, SUN VALLEY PROPERTY NEWS, September 2016. Michele Corriel, Ones to Watch: Gordon McConnell, WESTERN ART & ARCHITECTURE, Winter 2016. Rebecca Gross, Painting with Grit, Art Works Blog, 2014. Interview in association with The Big Read True Grit celebration. Sabina Dana Plasse, Sun Valley: A Cultured Holiday Retreat, ART LTD., November/December 2011, pages 68-70. Teresa Elliott and Gordon McConnell: Contemporary West, AMERICAN ART COLLECTOR, June 2010, pages 178–179. NEW AMERICAN PAINTINGS, Number 72, October/November 2007, Volume 12, Issue 5, pages 92–95. Lennie Bennett, A Vast Range, ST. PETERSBERG TIMES, April 22, 2007, page 8L. Paul F. Vang, Gordon McConnell: Revisualizing the Old West, THE MONTANA ARTS & CULTURE MAGAZINE, October 2006, pages 16–17. Kristen Rickels Prinzing, McConnell paints art to think about, THE BILLINGS OUTPOST, June 9, 2005, pages 21, 32. Jim Larson, Exhibitions blend to tell Western story, THE BILLINGS OUTPOST, April 14, 2005, pages 21, 26. Jaci Webb, Tuning into Western icons: McConnell’s horses, cowboys inspired from both first-hand and media perspectives, THE BILLINGS GAZETTE, March 25, 2005, page 5D. Elizabeth Guheen, Straight Shooting: The Paintings of Gordon McConnell, in Gordon McConnell Paintings, YELLOWSTONE ART MUSEUM, 2005, six-page brochure. Felice Koenig, San Antonio Update, GLASSTIRE.COM, June 16, 2003. 'Things Have Changed' charts new artistic territory, THE BILLINGS GAZETTE, December 20, 2002, page 19-D.
Out West: Adam Jahiel, Photographs; Gordon McConnell, Paintings, UCROSS FOUNDATION ART GALLERY, 2001,16-page catalog. NEW AMERICAN PAINTINGS, Number 24, November 1999, Volume 4, Number 5, cover illustration and pages 3, 110–113. Gary Svee, State transcends labels, THE BILLINGS GAZETTE, April 14, 1996, page11C. Westerns provide artist's inspiration, THE BILLINGS GAZETTE, September 23, 1994, page 7D. Christene C. Meyers, Westerns inspire modern show, THE BILLINGS GAZETTE, January 15, 1993, page 3D. Marc Vischer, Western movies inspire new paintings, THE BILLINGS GAZETTE, February 5, 1988, page 3D.